I don't know if you've heard, but a podcast I recorded with Jeremy Parish, of 1UP.com and USgamer fame, made its way onto the Internet yesterday. "I've sat on this audio conversation all this time for a few reasons—chief among them being that I wasn't sure I really wanted to commit to another podcast project. And as much work as I'm putting into detailing the GameBoy's history, building yet another retrospective layer seems a bit like overkill." You may have noticed that he described this as being part of a larger project. That's because it was--originally. Parish approached me about a year-and-a-half ago to see if I'd be up for combining forces to create an on-going podcast that would complement his Game Boy World site and books. I agreed on the spot, of course. It actually took us a good number of months to coordinate the recording session that produced the podcast that can be listened to here. (It covers the system's Japanese launch as well as its first four games--Alleyway, Baseball, Super Mario Land and Yakuman.) I want to say it was about six months, but it doesn't really matter in the end, does it? 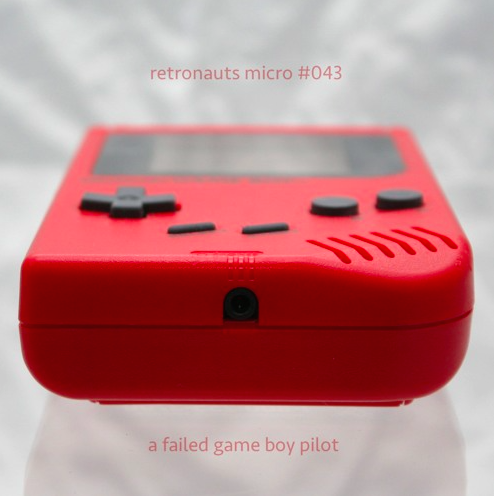 Speaking of the end, despite what Parish himself said in the USgamer write-up mentioned above, it's possible he and I will reconvene to chat about Nintendo's first handheld system--and its underrated catalog of games--in future Retronauts Micro episodes. In the meantime, give this "almost lost" pilot a listen. If you enjoy it, please let me know in the comments section below or on Twitter. Even better: pass it along to others who you think may get a kick out of it.